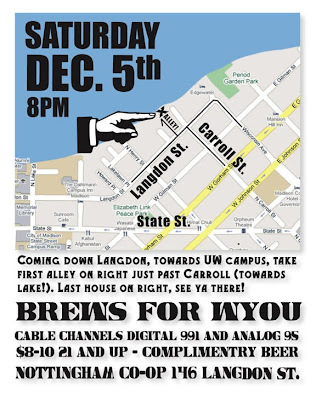 WYOU announces " Brews for WYOU," the first event in a craft brewers series to preserve community television to be held at the Nottingham Co-op, Saturday, December 5th, 2009. Tickets are $8 and $10. 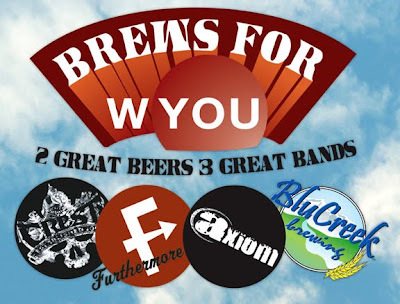 Beginning at 8pm, fine beer from FURTHERMORE BEER & BLUCREEK BREWING will be poured, WYOU programming highlights will be projected on the coop walls and Cooking With Bob will be grilling live and in person on the patio. The entertainment program features an adventurous sampling of live Madison music including hip-hop stalwarts THE CREST, grunge mavens AXIOM, indie rockers THE SESTERS, plus a genre blending mix from DJ POLABEAR. Come meet the brewers and enjoy fine brew, watch eclectic homegrown video and Access TV Legend COOKING WITH BOB grill, and dance the night away. All of this will be under one roof at the historically eclectic NOTTINGHAM CO-OP at 146 Langdon St. on Lake Mendota. The WYOU Board of Directors will meet tonight, Monday, November 23rd, 2009 at 6:30pm to discuss 2010 operating budget options. WYOU’s PEG Funding has been cut by 50% for 2010. While eight City of Madison Alders voted in favor to restore funding at the City Council Meeting on November 11th, ultimately Amendment #3 failed, leaving WYOU to receive just $70,000 in 2010 from the City’s PEG fund (PEG stands for Public, Education and Government). We'll discuss where we will go from here. ALL MEMBERS ARE WELCOME TO ATTEND THE MEETING. Hey there. We've been toying around with a few different ideas for fun things to do as possible fundraisers. One of the tings we came up with was a movie night. Seeing as we have a good amount of fairly open space in the studio, we were thinking to set up a projector and screen and watch a movie, eat popcorn, and the like. The movie could be anything from Metropolis to Be Kind, Rewind. What WE want to know is if you all think this is a good idea and/or if you would be willing to pay a couple bucks to get in. 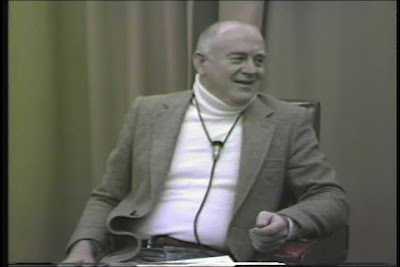 On Friday November 13th, 2009, WYOU Community Television Bequeathed David Runyon’s “Nothing To Hide” Master Tapes to UW’s Memorial Library. Read The Badger Herald article. 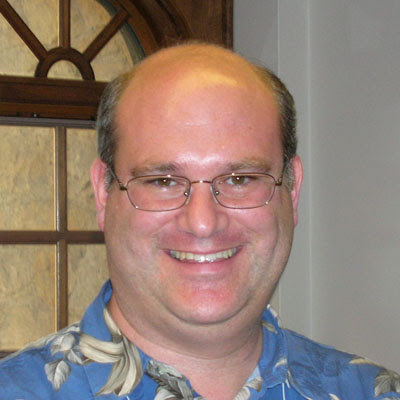 WYOU Technical Director Eric Allin appeared yesterday on the Queery show on WORT Community Radio along with Scott Seyforth, an administrator at UW-Madison. The topic: the WYOU bequeathment of the David Runyon’s “Nothing To Hide” Master Tapes to UW’s Memorial Library. Listen to the show. Then come attend a special reception marking the transfer of ownership of the master video tapes to the Memorial Library on Friday, November 13th, from 4:30pm – 6:00pm in the Library’s 4th Floor Commons. Speakers set to commemorate the event include: Congresswoman Tammy Baldwin, Representative Spencer Black, Wisconsin State Legislature, Ken Frazier, Director of the UW-Madison General Library System, and Richard Russell, political activist and one-time WYOU Board Chairman.on Friday, November 13th, from 4:30pm – 6:00pm in the Library’s 4th Floor Commons. Madison City Council Fails WYOU! In a 12 to 8 vote, the alders chose not to restore $30,000 of the $70,000 they will be taking away from WYOU in 2010. The station will go from $140,000 PEG funds in 2009 to just $70,000 in 2010. Giving voice to the people and supporting free speech is not important to Mayor Dave or the majority of the alders. Instead, the monies they are taking away from WYOU will be going to their personal station, the City Channel. City Channel currently gets the vast majority of PEG fees that come from Charter Cable subscribers, but now they will have nearly all of it! Thanks Mayor Dave and council members for letting such a valuable resource and community builder like WYOU slip away. You have failed us and the Madison community. WYOU Needs You NOW: City Council Meeting Tonight! The Madison Common Council meets tonight (Tuesday, 11/10) to deliberate on the City's 2010 Capital Budget and the Operating Budget. Amendment #3 to the Operating Budget puts $30,000 back into the PEG fund for WYOU. Please come tonight and register your support for Amendment #3. You don't have to speak; you don't even have to stay for the meeting. Your registration card with your support for Amendment #3 will be read during the public comment portion of the meeting and will help WYOU! The meeting takes place tonight at 5:30pm at the City-County Building, located at 210 Martin Luther King Jr Blvd, in Room 201. 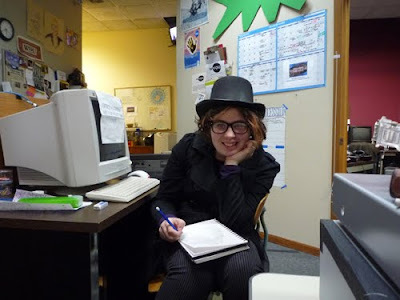 Abi is just one of numerous high school and college interns that have worked at WYOU over the past year. Interns get hands-on experience, learn how a television station works, and get school credit for their time. Depending upon their interests, interns may edit programs, shoot video or help out in any number of other ways. The Daily Cardinal: "WYOU an integral part of Madison"
Read the article in the Daily Cardinal in support of WYOU. WYOU needs your help now! 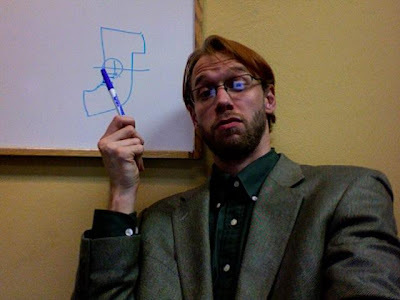 Mayor Dave is planning in the new Madison city budget to take away half of our PEG funding (non-tax payer funds) and to give it to the government channel. The mission of WYOU--to educate people in the use of video production equipment and to give a voice to the community--will be severely if not completely diminished. It's not too late to contact your alder and ask him/her to support an amendment that would restore $30,000 of the $70,000 cut! We have 7 or 8 votes at the moment and are working on more! 1. Ask people to email allalders@cityofmadison.com in support of the amendment. - Sponsors at the moment are Alds. Schumacher, Rummel, Solomon, Rhodes-Conway, Skidmore, Verveer - You can thank them, and ask others to sign on. - You can find your alder here: find your alderperson. 2. Show up to register on Tuesday. Stay if you can! On Wednesday they will likely not take any testimony, but just vote on the amendments that we care about. Since we are dead last . . . we'll be there to the end. I would be helpful to have bodies in the room to help make sure that they don't forget our testimony from the previous night. Below is a chart showing how the current 2009 PEG monies are divided between the government channel and WYOU. Note that we already get a smaller percentage. Now Mayor Dave wants to cut our funding in 2010 by half of this and give it to the government channel--not a fair deal. WYOU is the station for the people. Don't let it die. WYOU relies on a handful of dedicated volunteers to help out and fill in the gaps here at the station. Volunteers may shoot video at local events, edit programs to be aired, help with fundraisers, write for the newsletter, and more. 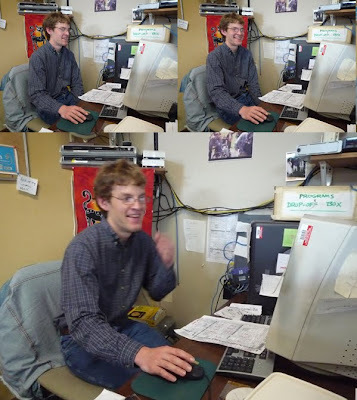 Our newest volunteer is Ryan Schmidt who assists with the automator script data entry and the loading of programs into the multi-disc player. Ryan also helps out with the membership mailings, DVD dubbing, and a multitude of other tasks. WYOU is donating the entire 800 video tape library of "Nothing To Hide," the late David Runyon's long-running television show, to University of Wisconsin Memorial Library here in Madison. A reception marking the gift will be held from 4:30 p.m. to 6 p.m. Nov. 13, on the library's fourth floor. Speakers are scheduled to include U.S. Rep. Tammy Baldwin, state Rep. Spencer Black, Director of the UW Library System Ken Frazier, Director for LGBT Outreach Center Steve Starkey, and former WYOU Board Chairman Richard Russell. WYOU volunteers and others will carry 25 boxes filled with the tapes on foot from the station, 609 E. Washington Ave., to the library at 728 State St. "Nothing To Hide" ran on WYOU from 1981 to 2001. At the time of Runyon's death in 2001, it was the longest-running gay and lesbian television show anywhere. 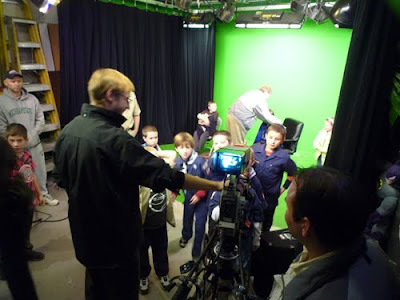 Two cub scout packs toured the station today where they learned about video cameras, non-linear editing and green screen studio techniques. A fun time was had by all! Madison Fire Chief Debra Amesqua was in the WYOU Studio today in recognition of her outstanding leadership with the City of Madison Fire Department. 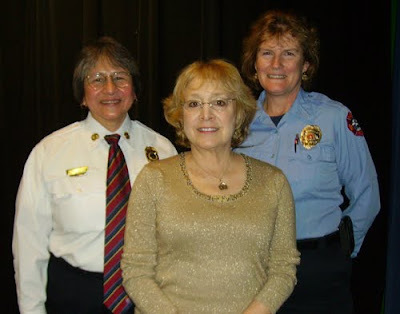 She was being interviewed by Carol Remz of the Seattle-based Fire 20/20, a non-profit connecting Fire/EMS with their multicultural communities to increase the reach and effectiveness of prevention and recruitment programs.